Could your water softener be harming your health and the environment? Did you know that traditional water softeners dump, on average, approximately 150 gallons of heavy salt brine water per week into septic and sewer systems? This leaks heavy amounts of sodium into our fresh water supply and can pose a serious threat to our health as well as the environment. The NuvoH2O salt-free water softener system prevents the calcium and magnesium minerals in your water from forming hard water scale in your plumbing. and loss of water pressure from calcium buildup. This system also helps to eliminate any existing hard water scale formation in pipes and water heaters. Instead of removing calcium-like conventional salt-based water softeners, this innovative system uses a process called “chelation” which works by binding, or stabilizing, the mineral ions that are found in hard water. 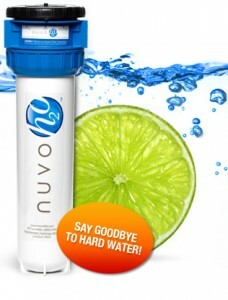 The inventive CitraCharge formula utilized by the NuvoH2O is a revolutionary way to handle hard water using citric acid, a naturally occurring weak acid found in many fruits and vegetables. The CitraCharge works as a binder to decrease the pH in hard water from alkaline to neutral. Once the calcium ions are bound to this CitraCharge, they cannot form scale or other hard water deposits; and since the minerals are bound, they easily rinse away from your body, hair, dishes, pipes, fixtures, and appliances. The NuvoH2O system will help increase the lifespan of your appliances and hot water heater by protecting them from the damaging effects of hard water scale. Cleaning will become simpler and will no longer involve harsh chemicals to remove stubborn hard water deposits. Now you can enjoy naturally conditioned water that is full of healthy minerals without the use of salt, wasted water, or electricity. 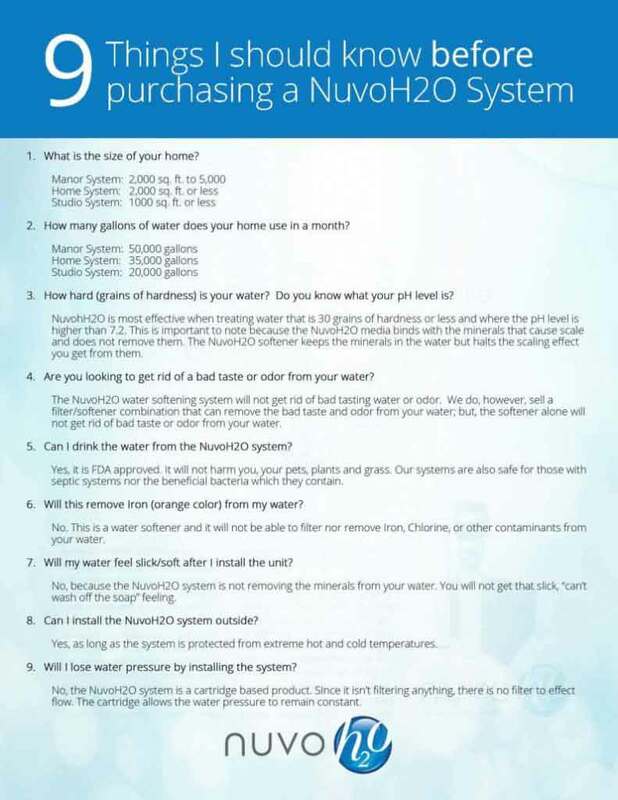 The NuvoH2O system offers you a beneficial solution to your hard water problems. Improve the quality of your water and improve the quality of your life. Purchase a Whole House Water Filter or Softener system from McLay Services, Inc. today and receive $100 off the cost of installation.